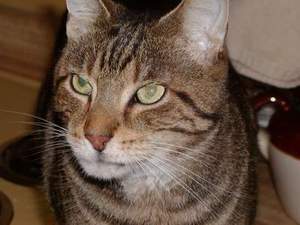 TJ, short-hair tabby (1982 - 1991)- TJ lives in the warmest part of my heart and memories. Her passing was the hardest to accept. I still struggle in adjusting to the loss of this sweet cat. There was something special about the way TJ knew just when you needed a hug and a kiss. She had loved Christmas trees and proudly claimed her favorite spot among the gifts each year. A rose bush marks where TJ is buried in our backyard, and as the roses bloom, it is a sweet tribute of nature to our beloved TJ who was just as beautiful. Barney (1981-1994), a Saint Bernard (runt of a litter). As an "only child" we grew up together. Barney was a guardian angel that kept watch over the home and family. Barney was a sheer pleasure in all meaning of having a pet; she was "a trusted and loyal friend". As Barney aged, blindness and deafness took toll on her health, in addition to earlier heartworm treatment. Due to declining poor health; sleeping peacefully was the only answer. A very hard bridge to cross. 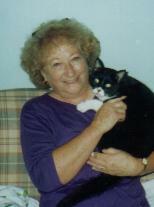 Barney dedicated her life to our family and letting her go, was very hard, especially for me. Tears always accompany memories of Barney. A huge love was lost when Barney left. I urge all pet owners to get your dog started on heartworm preventative. 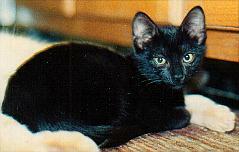 Little One, (1990-2001) a solid black cat, was our hunter. He was my replacement for the cat I lost due to getting hit by a car. He loved to get milk whenever he can. Lil' One knew when the refrigerator door opened or when my mother goes for coffee...he would get milk. His tail would start shaking, as he got so excited. He and Thomas were best of buds when he was little, which I think he picked up some bad habits. He loved hamburger meat. 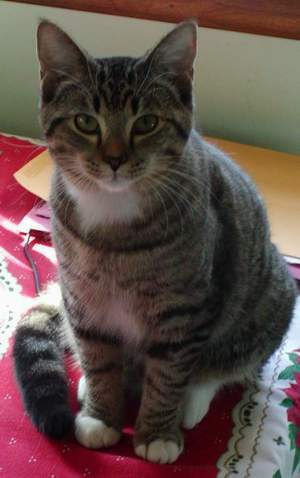 This cat has gone through some beating from other cats, but he bounced back with no problems. He developed cancer on his leg. The tumor was once removed, but returned quickly. He was a very good cat and it was hard to lay him to sleep forever. Rest in Peace Lil' One - we love you! 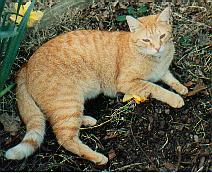 Thomas (1990-1992), short-hair orange tabby. "Tommie-kins" as he was affectionately called, ran away for nearly 3 months, until one morning..there he was...on our window sill looking in. It was my mother's birthday and she was so excited that she ran out the door to gather him in her arms. He looked like he was surviving on mice & squirrels. My mom said he meowed at her lovingly, like he began to recognize her. Then he turned and ran off again. He hasn't been seen since. My mother told me it was a wonderful birthday gift, a small prayer that only the Lord knew of, hoping to see him once more was all that mom asked for that year. 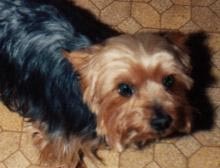 Booger Bear (1984-2000), a yorkshire terrier, was a "momma's boy". He'd follow my mom everywhere she went. She'd go to get ready for work and he'd be around the corner waiting. He was a stubborn dog though, but he sure knew when it was bath time! 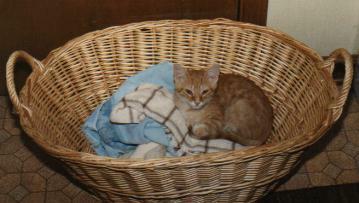 He'd go hide in his bed when he saw us getting the towel out and heading toward the sick. He knew what that was about. He loved to go for rides, everytime the car keys jiggled, he'd get excited. He sure did go through some touugh times though. He had to be treated for heartworm and had to have surgery on his back because one the other dogs pawed him in play one day. Boogie lived to be 16 years old. Failing health, he passed away. My mom and I took it pretty hard. Momma missed him dearly. 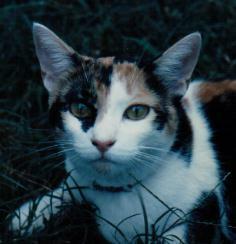 Patches (1990-2009) is a petite, bob-tailed, calico Manx. She is Momma's cat, but recently has become Daddy's Girl with my step-father, Bruce. A little neighborhood girl knocked on our door and asked if we'd take her. The reason? This cat was too mean. She does stand her ground and takes little grief off any other animal we have. The veterinarin wears leather gloves whenever Patches is seen. 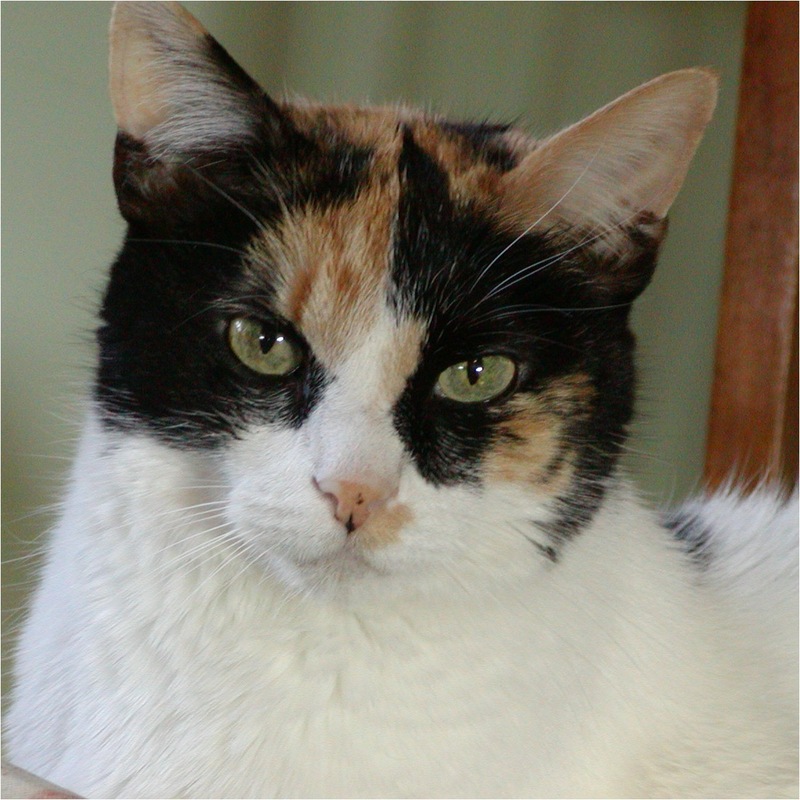 Patches is a shelf-cat, and a loner, but a pure delight whenever she's in the mood for love. Petting is strictly on her terms. Callie is a pure calico and passes as Patches twin. Her former owner developed allergies and she was about to be shipped to the pound. Another loner, Callie enjoys her privacy, but is known for her wonderful conversations when she wants company. She's declawed, but Boy can she pick a fight. 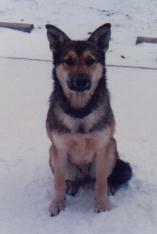 Sheba (1994-1998), a German Shepard. We answered an ad, where the previous owners had her as apuppy in an apartment and she was getting too big. Sheba was nearly 2 years old when we got her. She adapted to the other animals welland loved the big backyard I had to offer. Several weeks after we adopted her, she developed a pancreatic disorder. Medicines allowed her to return to minimal activities, until her health took a turn for the worst. Sheba took pride in her self-appointed responsibilities of guarding the yard from trespassers. 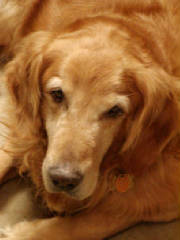 Sheba always struggled in health; but she was a loving and devoted dog. She loved her hugs and gave plenty of kisses in return. She was a sweet-talker. With so little time and struggling with health. Sheba passed away silently leaving so much more to give. 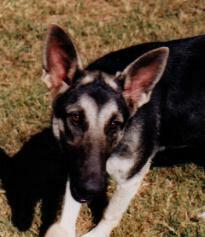 Rex (1992-2002), German Shepard was a sweet little pup. He had that puppy smell to him when we got him from an ad someone put in the papers about puppies. His mother wasn't giving out enough milk and all the puppies she had were getting malnourished. We picked one, which was Rex, and nursed him back to health. When he smelled can food or any food for that matter he was like a pirhana. He was nearsighted so he couldn't see very well because the way his mother was and so he had a hard time seeing things. He loved to chase the flashlight all over the yard and house. That was the craziest thing we had ever seen when we had noticed it. He LOVED carrots, which my mom thinks helped his eyes. We called him the "bull in a China shop", because he knocked things over with his tail and when you let him in, you had to tell him to get a shoe like a pacifier. He was intimidating because of his side and was bullheaded at times, but he was just a big cuddly bear when he let you love on him. My stepfather, Bruce and Rex really bonded and it tore him up when we had to put Rex to sleep. Rex developed pancerus and esophagus cancer. Rest in Peace good buddy! We will miss you. Mom marks his spot with homegrown cut flowers and his deflatted football. 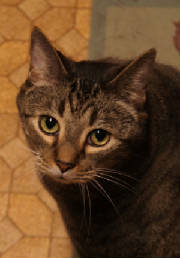 Jackie, tabby was adopted from the same hospital that Boogie was in. Jackie was treated there, after a stranger brought him witnessing that he had been hit by a car. The accident had crushed his face. After treatment, Jackie was going off to the pound for adoption. He reminds us of "TJ". We couldn't help but fall in love with this fella. He is a "matter of fact" cat. Waits patiently at the water faucet until someone turns it on, will sweet talk you out of a bite of whatever you're eating. He is called "Gina's Cat", because he comes and sits in my lap and I'm the only one that can mess with him, but he does let you know when he's had enough. Jackie is sweet loving cat and love him dearly. 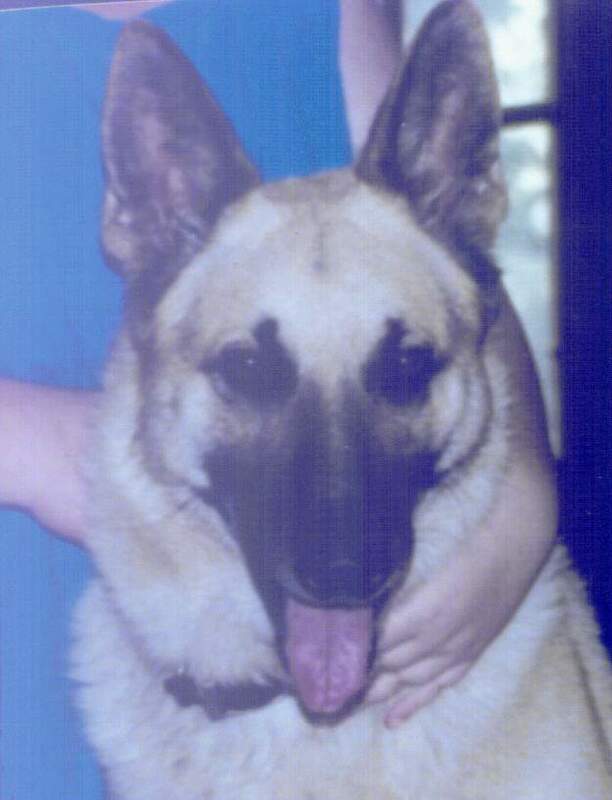 Rennie (1986-1989) a German Shepard mix was a sweet dog. She got set up alot by Barney and never knew who was doing the real chewing up of things. Until, I think after we had given her away to a good home, that we noticed that Barney was doing it all and was setting her up. 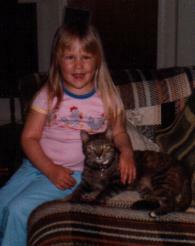 Rennie loved to get brushed outside and she always loved to play with people, especially Barney. She was a good and sweet dog and we miss her. Birdie (1997-98) was a traditional bird dog. She was 4 months old when we got her from the Humane Society. She was a good dog and liked to play with Rex, but she needed a place to run. She would climb the fences like a cat and when she got through climbing the fences. 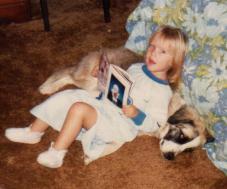 She would eventually make it to the streets where neighbors would call and tell us that our dog was with them. We brought her back to the Humane Society in 1998, hopefully someone with a big farmland adopted her. Good Luck Birdie!!! Cody (2000-2011) is a Golden Retreiver. He was a pretty good boy, he was always so quiet in the house. He'd greet me at the door when I'd come home from work. He loved to play with my step-father, Bruce. Although Cody did pick up some bad habits with Rex. He was constantly on the go for chasing the flashlight. All you need to do is say "Where is it?" and he looks at the ceiling. We will truly miss you my friend! Rest In Peace ole' boy! Buddy was a very affectionate cat. He loved his belly rubbed as turned over and stretched. You always knew when a dog or cat that he did like was getting near him, but he'd let this terrible meow like trying to say "get away from me". He loved to pick on Booger Bear though. Whenever he got cold, he'd snuggle in your lap and go to sleep. He also ran away from home, as we think all the animals got to much for him. We haven't seen him since. 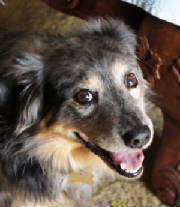 Pacus, (2000-2016) an Australian Shepard was adopted by a website called "Open Paw Pet Rescue". He is a mess in itself, he loves playing with Cody and they have alot of fun with each other. He's a smart dog and sounds terrible when he barks outside for someone to let him in or when someone leaves the house. He's still learning about the cats and when they all first met they weren't too fond of each other. He loves to rustle around and chew up your hand in the process - haha! *Pacus went downhill fairly quickly after suffering a stroke. He couldn't move or stand up on his own one morning, so we had to make a decision. He passed in 2016. Willie (2005-2017) was a gray tabby and was just 6 months old when we got him. Bruce and mom surprised me on a Dec. 27th, when they drove up after a couple of hours I got home from work. Mom said Bruce kinda felt bad that I kept looking for Jackie and Callie (which I still do). When he first got through looking around the house he made a leap to the middle of the christmas tree, but stopped him in mid-air. He is my baby, always laying in my lap or wanting me to hold him. When I wake up in the mornings he's always standing by his food bowl meowing at me to be feed. *Willie developed Diabetes in 2014, to which being my first cat with Diabetes I was learning to treat him, though it wasn't working. He passed away in February 2017. 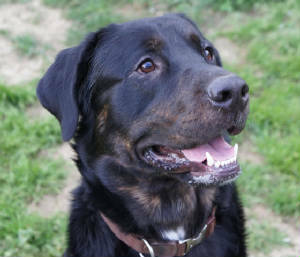 Harley is a black lab/burmese mountain dog mix. Harley LOVES to go out and play every chance he gets...frisbee and ball throwing. When we first got him, mom pretended he had fleas on him and when he nibbles on you he acts like you got fleas on you. Weird little thing he does. He gets along with Pacus fine. He's hyper as all can get, but he's a good dog. Just have to get him from being bored as he's chewed the corner of the couch up. Harley eats anything in sight. We now call him "Big Galoot". He has the same temperament as what Cody had, very laid back, but defend and protect you in a heartbeat. He loves to stick his head underneath my mom's arm at breakfast time waiting for her to be done. He goes berserk of the word "squirrel!". 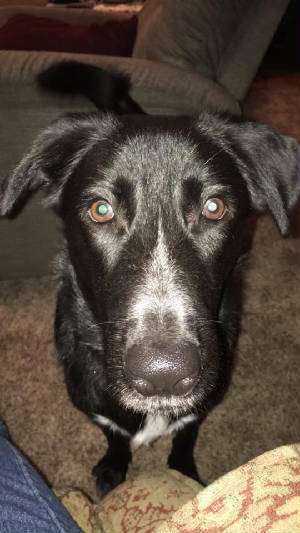 Sammy (2016- present) is a German Shepard / black lab mix. We got him shortly after Pacus passed. He is still in the learning stages of things, as he's almost a year old. When we got him he was fairly trained, as he doesn't potty nor barks in the house. When he did eventually barked for the first time, it startled me. Unfortunately he's still in the chewing stages and likes to lick and bite on your fingers. Overall he's a sweet boy, but very active dog. 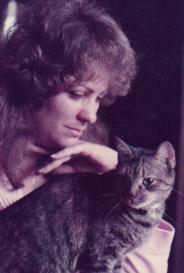 I love all the animals that I've had past and present and think of them daily. I'm so happy I got the chance to meet and spend time with each one of them. May God Bless all the ones who are not with us today.